Maintaining a focus on end users’ needs is essential to our development and design teams. With those needs in mind we are very excited to bring the GM4400 2D reader to the marketplace and complete our Gryphon GM440 2D reader series. The continued expansion of information highways worldwide poses new challenges for data collection. The increased need for gathering specific information has resulted in an ever increasing usage of 2D and stacked bar codes. In response to those needs, both today and in the future, Datalogic Scanning is proud to introduce the Gryphon™ I GM4400 2D bar code reader. Standing at the forefront of the data collection offerings available in the marketplace today the GM4400 reader features excellent performance and versatility on many levels and completes the highly successful Datalogic Gryphon™ family of premium level data collection equipment designed for general purpose applications. 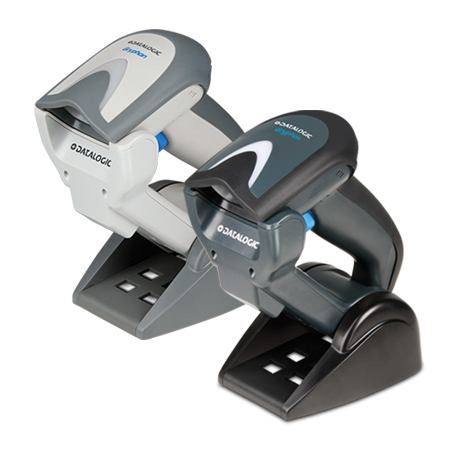 The GM4400 reader is an area imager that provides true omnidirectional reading of both 1D and 2D bar codes, regardless of label orientation and features the inclusion of Datalogic’s Motionix™ motion-sensing technology. In Retail environments, checkers will enjoy the easy automatic transition between stand mode and handheld mode. Its light weight and ergonomic form factor, combined with the non-flickering deep red illumination to decrease eye strain, make this unit a prime choice for checker comfort. Sharing common features with other Gryphon 4400 readers, the GM4400 imager presents users with a highly visible 4-dot aimer, Datalogic’s patented ‘Green Spot’ technology for good read feedback, and full image capture capability that aids in identifying poor codes, damaged packaging or missing items. Excellent performance and snappy reading of virtually any bar code symbology including 1D, 2D and Postal codes plus stacked and composite codes like PDF417 and GS1 DataBar is assured when using the GM4400 reader. Multi-interface options available are RS-232 / IBM4XX / USB Multi-interface or RS232 / USB / Keyboard Wedge / Wand Multi-interface. A strong return-on-investment (ROI) is aided by an IP52 rating, 1.8m / 5.9ft drop resistance, a Lithium-Ion 2100 mAh battery offering 60,000 scans per charge, and the downloadable Datalogic Aladdin™ configuration software. The GM4400 imager easily handles mobile marketing, mobile ticketing, electronic coupons, loyalty cards, and driver’s license parsing applications. Whether front room, back room, warehouse, specialty retail, POS applications, government, banking or healthcare needs arise, the Gryphon 4400 imager series provides the solution. In the near future the GM4400 reader will also be available with Disinfectant-Ready enclosures designed specifically for healthcare environments. Datalogic’s STAR Cordless System™ radio is featured in the GM4400 reader. The Datalogic STAR™ radio system provides a secure, narrow band communications solution enabling total mobility and real-time two-way communications at a highly affordable price. A 433MHz radio frequency option is available now, and a 910 MHz frequency option will be available soon. The GM4400 reader offers an open air radio range of 30.0m / 93.4 ft for both frequencies. The GM4400 reader series offers scalable networking solutions from simple point-to-point connections to point-to-multipoint installations with up to 16 readers connected to the same base station. When used in batch mode, the reader can store more than 1200 codes, more than enough for most applications. The base station itself is operable with other Gryphon series readers including the GM4400 area imager and the GM4100 linear imager; providing a real bonus for protecting investments allowing the migration of scanners as needed. Datalogic’s patented 2 position cradle has Scan-While-Charging capabilities. Datalogic and the Datalogic logo are registered trademarks of Datalogic S.p.A. in many countries, including the U.S.A. and the E.U. Datalogic Aladdin; Datalogic STAR; and Datalogic STAR Cordless System are trademarks of Datalogic Scanning Group S.r.l. Gryphon and Motionix are trademarks of Datalogic Scanning, Inc.
For additional information about Datalogic Scanning products, please visit our web site, email marketing(dot)scanning(at)datalogic(dot)com, or call +1-800-695-5700 (toll-free in the USA only) or +1-541-683-5700.